The #1 New York Times bestseller from FOX News star of Tucker Carlson Tonight offers “a targeted snipe at the Democrats and Republicans and their elite enablers” (New York Journal of Books) in a funny political commentary on how America’s ruling class has failed everyday Americans. “Informal and often humorous…an entertainingly told narrative of elite malfeasance” (Publishers Weekly), Tucker Carlson’s Ship of Fools tells the truth about the new American elites, a group whose power and wealth has grown beyond imagination even as the rest of the country has withered. The people who run America now barely interact with it. They fly on their own planes, ski on their own mountains, watch sporting events far from the stands in sky boxes. They have total contempt for you. 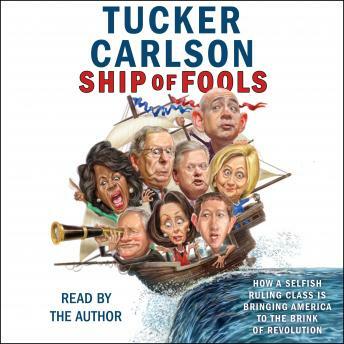 Our leaders are fools, Carlson concludes, “unaware that they are captains of a sinking ship.” But in the signature and witty style that viewers of Tucker Carlson Tonight enjoy so much, Ship of Fools is “bulging with big and interesting ideas, presented succinctly with wit and precision, each chapter a potential book in itself” (The Washington Times). This was a great book and Tucker did an excellent job reading his book. The information presented provides a great track record for our political as well as foreign affairs waffling over many years. We are an easily confused and uneducated people and probably deserve the administrative overlords and ruling class that control our lives.